Brett is going to be a Dad! Check-out Brett & wife Taylor’s Gender Reveal moment! Less than four months after joking to PEOPLE about how he was ready to have kids with new wife Taylor sooner rather than later, PEOPLE exclusively confirms that the country singer-songwriter and his longtime love are expecting their first child in early fall. “We have always shared the same heart for wanting a family,” Young, 38, tells PEOPLE of the couple’s happy news. “I love knowing that we get to give this little one an amazing life, and I just can’t wait for the future ahead of us as a family. We are so blessed!” Read the full story HERE! Watch Brett sing ‘Here Tonight’ on Today Show, click HERE! 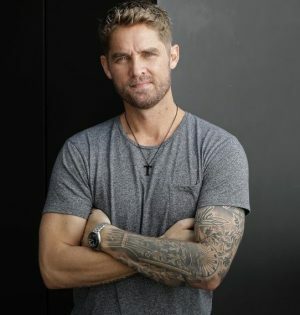 Brett Young appeared behind the Clubhouse bar on Bravo’s Watch What Happens Live last night (9/17).